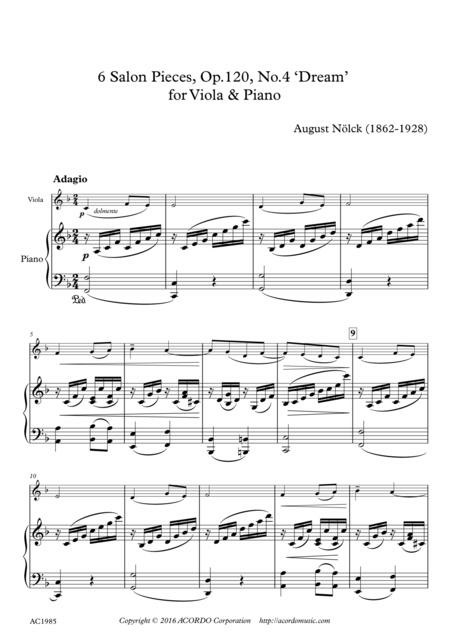 Composed by Nölck, August (1862-1928). Arranged by Mikio Kamada. Romantic Period. Score, Solo Part. 4 pages. 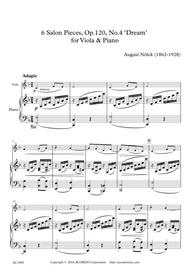 Published by ACORDO Sheet Music (S0.127749). August Nölck (1862-1928) was a composer, cellist, and pianist. He composed many small pieces for cello and Piano. 6 Salon Pieces, Op. 120, were originally composed for Violoncello and Piano, which consist of No. 1. 'Gypsy Maiden', No. 2. 'Aria', No. 3. 'A Dream', No. 4. 'Prelude', No. 5. 'Mazurka', and No. 6. 'Ring Dance'. No.3 'A Dream' is a small but very pretty piece.